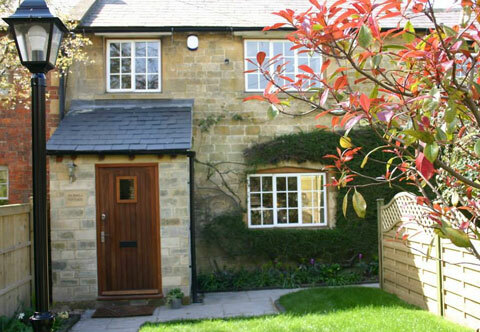 Silk Mill Cottage is stunning 3 bed cottage offering spacious luxury accommodation for 5 people. Refurbished to an immaculate standard, this cottage sits in the grounds of The Old Silk Mill and is a 2 minute walk from Chipping Campden's high street. Silk Mill Cottage is stunning 3 bed cottage offering spacious luxury accommodation for 5 people. Refurbished to an immaculate standard, this cottage sits in the grounds of The Old Silk Mill and is a 2 minute walk from Chipping Campden's high street. The cottage is along a gravel path surrounded by beautiful foliage and well looked after gardens. There are two small gardens to the front of the cottage and a peaceful courtyard to the rear offering an outdoor area, part open and part covered, with table and chairs, ideal for alfresco dining! The entrance hall opens out into the sitting room with exposed stone walls, comfy sofa's and a delightful little log burner. The sitting room, dining room and kitchen are open plan with a beautiful wooden staircase. Beyond the kitchen there is a utility room with w/c. There is under floor heating in the cottage. Gorgeous beamed bedrooms, one double with en-suite shower room, a twin room with en–suite bathroom and a single room with a single good quality sofa bed which shares the twin room en-suite via a separate door on the landing. Two parking spaces are provided with the cottage in the grounds of The Old Silk Mill. Prices include all linen, towels, tea towels and heating. Facilities include Digital television with Blu–Ray DVD and Freeview, Microwave, Electric and ceramic hob, Washing Machine, Tumble Dryer, Dishwasher, Iron / Board, Hairdryer, Free Wifi, Wood burner with a basket of logs and kindling.